Why couldn’t the Corporate Old Boys’ Network Stop Trump? Just spotted a very interesting article about the decline in ties among the corporate elite and its relationship to polarization and the Trump candidacy. Very interesting piece well worth mulling over. Here’s the link. Hi folks. When you hear this I’ll be boarding a plane for Pittsburgh to give a talk, and I’ll be missing a couple of days of the fund drive, though friends and family from our Peace Corps days will be helping out at the station as well as contributing from home. This station is important to us – and this election season makes clear why. On WAMC we get news that is fact-checked. We get opinions that are explained, not just thrown at us like so many ipse dixits. We get interviews with people on both sides of political campaigns. And we get cutting edge science about energy, water, the climate, the economy and other matters of interest and importance. This station is a treasure. Alan on the Congressional Corner, Joe on the Roundtable, Terry Gross on Fresh Air and others aired on this station interview candidates, writers, experts and media personalities so that we can understand what they are saying. They give people the time and the space to explain themselves. Too many interviewers are driven only by the drama of cutting people off. But on WAMC we actually get to understand the basis of what people are trying to tell us. I know Alan disagrees with what some people tell him on the Congressional Corner. But he let’s them make their points for our benefit. I’ve come to know lots of people Joe interviews and they all reacted that doing interviews with him is a pleasure because Joe helps us – he’s interviewed me too – to get our points out so that you as listeners can understand and evaluate what we are telling you. It’s particularly obvious in a political season like this when people are trading barbs. One needs a station whose principle commitment, to itself and to us in the audience, is to tell the news accurately rather than bending stories to suit one side or the other. Of course I can get specialized information when I need it. But I also need a grounding that is not prepared specially for my personal tastes and interests, a grounding that gives me news and information I might not find in my own personal quest. And bless radio. I can relax and listen while resting my otherwise overworked eyes. My wife and I can put the news on over a meal, while we share and discuss it. — This commentary was broadcast on WAMC Northeast Report, October 18, 2016. 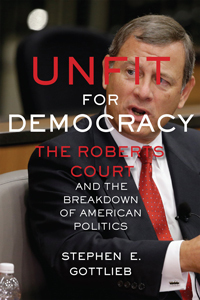 I’ll be delivering the Sherman David Spector Memorial Lecture – Unfit For Democracy: The Roberts Court and the Breakdown of American Politics, at 7:30 at the Bush Memorial at the Sage Colleges on October 27, 2016, in Troy, NY. Last week, on Oct. 18, I spoke to the faculty at the Duquesne University School of Law on the implications of Unfit for Democracy for constitutional interpretation. I walked by a group talking about the election and a young woman was saying she would never vote for Hillary because of her personality – I forget the word she used. So I stopped and asked her if that was the most important thing in a candidate. She responded “Yeah” like wasn’t it obvious and went on talking. I moved on shaking my head about her naiveté. This president is going to have to deal with Russia, China, the Muslim world, climate change, and her personality is the issue? The next president is going to have to be cool under pressure, not shoot wildly from the hip, and understand the stakes, the pressures, the possibilities and the limitations of what we can accomplish, and her personality is the issue? I know some people want to feel like they could have a beer with the president. I think George Bush would have been great to sit down with over a beer. From all accounts I think he’s probably a really nice guy, and easy to get along with. But he was so unprepared to deal with foreign affairs that he made mistakes that will reverberate for decades, if not centuries. I want someone who is preoccupied with what he or she needs to know – which doesn’t tend to make good drinking conversations. I’ve never met Clarence Thomas but the people I do know who know him tell me he is a really nice guy to be around – including, despite the Anita Hill affair, some of the women who have worked for him. But I think he has been a disaster as a member of the Supreme Court. I did meet Chief Justice Rehnquist, more than once. Sweet guy, at least toward me. But I’m convinced he led the Court in disastrous directions. I’ve also met Breyer. He’s much more often on my side, so Steve, please take care of yourself and stay on the Court. But as far as I’m concerned, if I sat down with Breyer it would be all about business. I didn’t like his apparent manner. I say apparent because what do gestures and expressions or tones of voice really mean about someone’s congeniality when you don’t really know them? Culturally we often think people who look over their glasses are being haughty – but former Secretary of State Cyrus Vance who wore reading glasses and generally looked over them when talking with me, was very helpful regarding things my office and I were trying to do on behalf of the disadvantaged, and in the process I learned to like him as much as I respected him, which was a lot. I’m not sure I’d even want a president to take the time to have a beer with me. I’d want her to be focused on what she needs to know to manage any of the life and death problems that are on her desk. I know presidents do take time out to meet people and try to seem connected. But I don’t have the need to take their time. The most connected thing Obama has had to do is to grieve with the families that have lost loved ones, soldiers, children, spouses, and I know he has been as deeply affected by that experience as any president. He’s got more important things on his mind than chatting with me. Lobby him? That’s not social; that’s business. Beer? That’s my problem, not hers. Personality? Give me a break. — This commentary was broadcast on WAMC Northeast Report, October 11, 2016. I wish it weren’t so, but the anti-democratic elements in this US election, and the Trump campaign, are making the dangers identified in my book seem like a near-term prediction – the well-justified revolt of the economically forgotten leading them to trust a bankrupt businessman and TV star who recycles empty promises, stereotypes and prejudices to gain their votes, the courting of the gun-toters coupled with thinly veiled threats and violence, the racist and male-chauvinist language, religious bigotry and xenophobia proposals, a candidate clearly out of control by the party he nominally represents, a demagogue repeating empty slogans until they start to seem believable, are all dangerous. Worse it seems to be a world-wide trend, Tom Gerald Daly, Time to View Democratic Decay as a Unified Research Field?, Int’l J. Const. L. Blog, Sept. 30, 2016, at: http://www.iconnectblog.com/2016/09/time-to-view-democratic-decay-as-a-unified-research-field. This clearly needs to stop. Let’s talk about Trump’s secrets, what he doesn’t want us to know about. Not secrets that may not exist – like his secret plans to deal with ISIS, North Korea or unemployment. Those might be secret as he claims because there’s a problem in revealing them. Or they might be secret because there’s nothing to reveal, they don’t really exist – but calling them secret makes it sound OK. No I mean secrets we can be quite sure really do exist – his tax returns. Let’s put that in English. A Court may order that failure to produce evidence is an admission that the facts are what the other party says they are. So by this standard what can we assume that the failure to release his returns means? The New York Times noted that: “He is running for the White House partly as a business wizard,” and asked “is he really as rich and talented as he boasts?” Mr. Trump’s tax returns might disclose that he is bankrupt, far from the billionaire he claims to be, that, contrary to his chest pounding assertions, Mr. Trump is a financial fool with little to show for his shenanigans. Is it fair to take that as proven by the standards courts use for undisclosed evidence? The New York Times asked: “Has he truly no conflicts of interest in Russia, whose computer hackers he has bizarrely invited to spy on Hillary Clinton, his campaign rival?” And Media Matters adds that Mr. Trump’s tax returns “could show Trump’s ties to Russia.” They could show that Russia is bankrolling his campaign, that Trump has an enormous conflict of interest in his dealings with a foreign adversary. Indeed, would they show that Trump is disloyal, a Russian agent? Is it fair to take that as proven by the standards courts use for undisclosed evidence? They might disclose that Mr. Trump has defrauded many other people by misrepresenting his assets. Is it fair to take that as proven by the standards courts use for undisclosed evidence? They might disclose that Mr. Trump has failed to pay his taxes, engaged in tax fraud, pays less than Hillary does or that he has parked his money abroad. Is it fair to take that as proven by the standards courts use for undisclosed evidence? They almost surely will disclose that he has a secret he doesn’t want us to know because it will destroy his public image and his claim to people’s votes in November. Trump’s failure to produce his tax returns is not the minor side-show he tries to make it. It gets to the fundamental fact that he is all sound and fury, a loudmouth, with nothing to offer, nothing to sell but empty boasts. Or should we use his language and start talking about “crooked” Donald? — This commentary was broadcast on WAMC Northeast Report, October 4, 2016. You are currently browsing the Constitutionalism and Democracy blog archives for October, 2016.